Performing proper garage door maintenance on a regular basis will help keep your system running smoothly. Although such complex devices have limited lifespans, the better you take care of themת the longer they can last. Unexpected problems can arise at any time, such as minor damage caused by parking accidents, or even simply failing to replace a spring at the right time. The Garage door repair services we offer can help you solve the more complex problems, and our maintenance appointments will help you prevent some of the most common issues. What Does Proper Maintenance Entail? 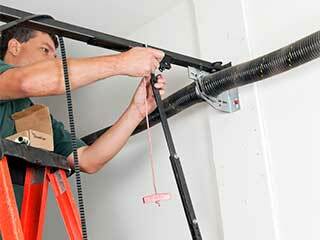 Maintenance should include an overall inspection of your system. From testing the reverse mechanism to checking the tracks and lubricating all of the moving parts, every step is important to ensure smooth and safe operation. Our professionals start by checking the pulleys, springs, cables, tracks, hinges, and rollers. Loose parts are tightened, and rusty fasteners are replaced. Since the whole point is to make sure the door moves evenly and safely, checking its balance, force and travel limit is one of our priorities. By testing the balance of your door, our technicians can understand whether they need to release or add tension to your springs. Every time you open the door, these components lose some of their tension, which is why their routine adjustment is essential. Alternatively, your door might not close well or open evenly. If it fails to close all the way, we also check and adjust the system's travel limit. Proper maintenance of the opener and all its various parts is also extremely important because its proper operation helps to ensure your safety. Which is the most important test? One of the first things our technicians check is the reverse system. The door must have enough force to close, but must also stop and reverse before coming in contact with anything in its path. Our experts also align the system's sensors. We make sure the lenses are clean, check the condition of their electrical wires and take a careful look at the control panel feedback. As for the rest of the opener's parts, from the chain and gears to the arm and trolley, we thoroughly inspect every single component and handle any issue we discover. WeT repair track dents, lubricated the rollers and inform you about whether there's a need to replace any specific part. Be sure to contact our Garage Door Repair Tempe team for any issue you may be experiencing. If you haven't serviced your door for a while or if you've been hearing strange noises lately, call to schedule an appointment for garage door maintenance!